The ECHL, the premier “AA” Hockey League in the country, was one of the first leagues to take advantage of the products offered by our company. As this league continues to rapidly expand each year, the popularity of our products will also expand throughout the years. 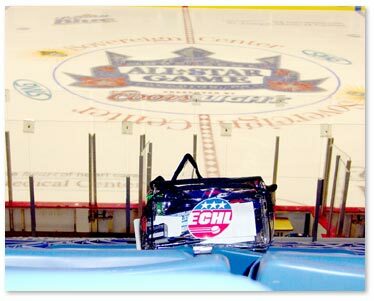 The utility bag, shown here at the ECHL All-Star game, is an extremely practical carry-all for all your personal belongings such as phone, camera, tickets, and snacks!